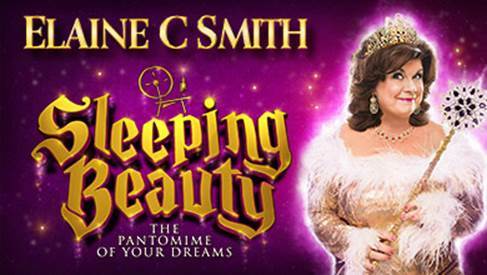 Elaine C Smith returns to the King's this panto season! She’s baaaack – oh yes she is! First Lady of Scottish pantomime Elaine C Smith returns to the King’s Theatre this Christmas to star in Sleeping Beauty where she’ll play The Fairy. The Great Dame returns to the King’s stage for the first time since 2004 where she played the title role in Mother Goose. Her first appearance at the famous King’s panto – which is renowned for upholding traditional elements of pantomime - was in 1996 during a run of Cinderella. Elaine wowed the King’s audience for years and is truly a firm panto favourite in Scotland. Elaine C Smith is perhaps best known for her role as Marydoll in the BBC sitcom, Rab C Nesbitt which she starred in alongside Gregor Fisher, Tony Roper and Barbara Rafferty for more than a decade. The actress and comedian has countless theatre credits to her name including The Steamie, I Dreamed a Dream, Shirley Valentine and most recently, Annie where she played Mrs Hannigan during the Scottish dates of the production’s UK tour. Elaine C Smith said: “I am absolutely thrilled to come back to the King’s this year. Hot-off-the heels of the phenomenally successful production of Cinderella last year, the magical tale of Sleeping Beauty will open on Saturday 2 December 2017 and runs until Sunday 7 January 2018. On the day of her sixteenth birthday the beautiful Princess Beauty is given a present by her evil godmother Carabosse. By pricking her finger on an enchanted spinning wheel she is placed under a cruel curse and forced to sleep for 100 years. Can true love survive and the handsome Prince Charming break the spell? This year’s King’s panto is produced by Qdos Entertainment, the world’s biggest pantomime producer with over 600 productions to its credit, and will feature all of the ingredients of the perfect pantomime; a fabulous cast and orchestra, laugh-out-loud comedy, stunning scenery and special effects, beautiful costumes and plenty of boos and hisses for all the family to enjoy. Box Office: 0844 871 7648 (bkg fee) calls cost up to 7p per minute, plus your phone company’s access charge.